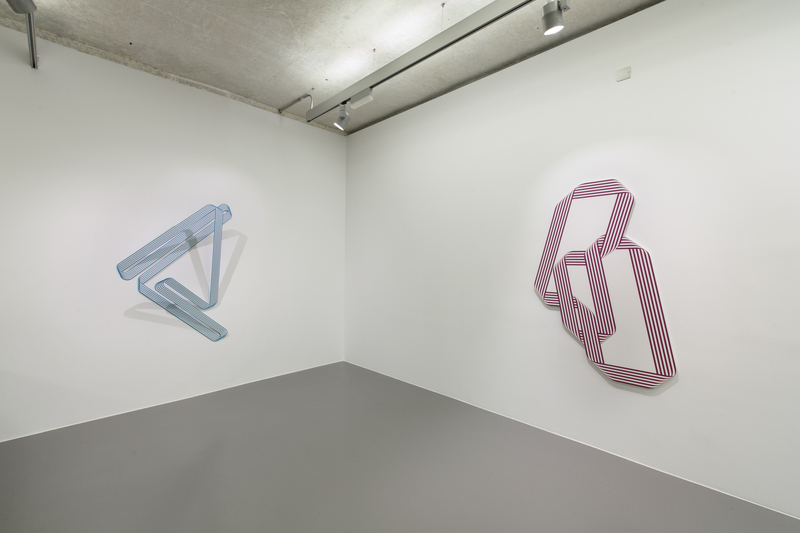 Terry Haggerty translates natural forms, man-made objects, and ambiguous shapes into engaging line compositions that oscillate between flat and dimensional space using simple two-colour combinations, as well as multicoloured line arrangements painted on shaped wood panels and fabricated metal. Using a simple curved line motif, Haggerty stretches the picture plane beyond view with running parallel lines that bend from sight to define both visible and invisible space. Within the confines of an outlined shape, multiple angles of a form, seemingly contradictory, are viewed from a single viewpoint. 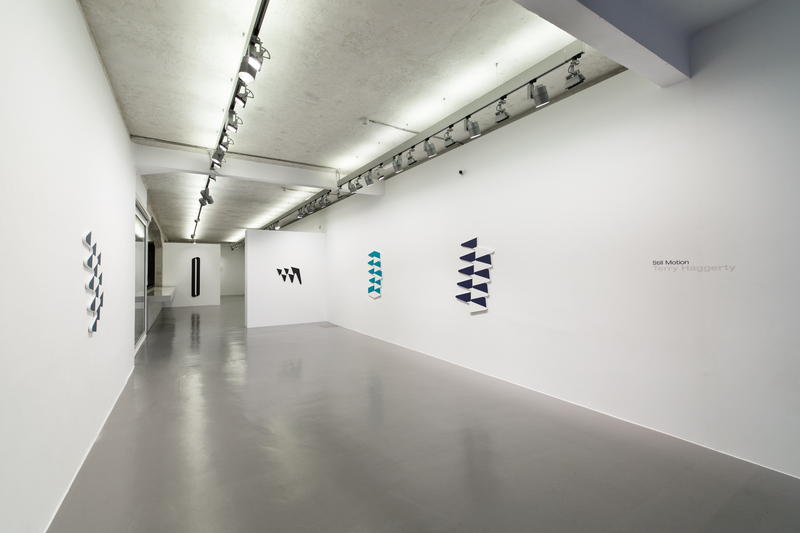 The focus of perception gradually shifts towards the visual qualities of the painted object. The viewer is drawn to their flatness and technically-consummate surface finish that gives the appearance of quasi-mechanical perfection. There’s no build-up of paint on paint to be seen; we are left with a non-reflective surface that leaves no history of its making, preserved in an encased varnished shell. For his first show at Ivorypress, Haggerty explores new territory with a series of recent paintings that move away from the line-based works with bold areas of flat colour that loop and zig-zag over the surface. Cutout sections operate as both positive and negative elements that define the varying structures, and give the image a more dynamic, sculptural appearance. Other works bend and twist in and out of space to form knot-like constructions that are suggestive of race tracks or road traffic interchanges. 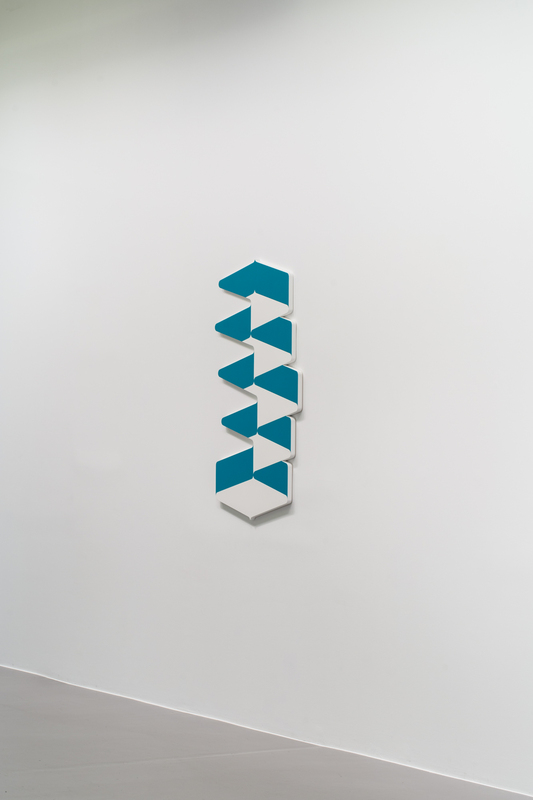 Also included in the show is a three-dimensional wall relief that introduces a physical element to the work by combining a painted image with a metal structure. The resulting composition reveals a glitch in the translation from painted image to real form, essential code is missing, yet the onlooking eye is able to suspend belief to realise this synthesised object. Terry Haggerty was born in 1970 in London, England, and lives in Berlin, Germany. He has exhibited widely at galleries and museums around the world, including Von Bartha, Basel; Sikkema Jenkins, New York; Max Hetzler, Berlin; Hammer Museum, Los Angeles; Aldrich Museum, Connecticut; and Modern Art Museum of Fort Worth, Texas. Commissioned wall drawings include Dallas Cowboys Stadium, Arlington, Texas; Munich Re, London and Roche Diagnostics, Indianapolis. Haggerty is the recipient of several awards including the For-Site Foundation Award (2009), John Anson Kittredge Award (2003); and the Natwest Art Prize (1999).